Nowadays, project management is everywhere. Whether you have a team of one or 1,000 — you need to make sure everyone knows what to do, when to do it, and how much time to spend on it. Most companies employ a full-time project manager to oversee the work process, and the most essential tool they use in their work is some form of project management software. Project management software helps teams plan, organize, and manage their work. There are lots of alternatives on the market: some are as simple as to-do lists and others include all the bells and whistles, like budget estimations, forecasting, and cost control. The most popular and widely used option by far is Microsoft Project. Microsoft Project was first developed in 1984 as an MS-DOS application, even before there were graphical interfaces. Over the years, it has gained a loyal global following and has become the go-to tool for the majority of project managers. Sadly, if you predominantly work on Macs, Microsoft hasn’t released a Mac-compatible version just yet, although the rest of the Microsoft Office 365 suite is available on Macs (short of Microsoft Access). So what’s the best Microsoft Project alternative for Mac? What Is Microsoft Project On Mac Alternative? Naturally, since Microsoft hasn’t been in a hurry developing an MS Project for Mac build, lots of Mac-specific players have entered the game, occupying all possible niches based on cost, features, tech support, and more. But to understand what makes a perfect competitor to Microsoft Project management software, we need to know what exactly Microsoft Project is revered for. Besides, Microsoft Project is a great tool for your business portfolio optimization and project evaluation to see where your organization is going and how it is doing. Finally, the software also does a continuous resource analysis, predicting bottlenecks and showing where resources are currently being underused. So the ideal alternative to replace Microsoft Project for Mac needs to cover most if not all of these features and do it well. And maybe even have a few cards up its sleeve too. For example, Microsoft Project’s cost of $500–1500 per install or $30–60 per user a month is a likely target for other up-and-coming apps. When we consider all available Microsoft Project alternatives, one stands out right away. In many ways similar to what Microsoft Project on Mac would be, it offers a more intuitive interface, easier onboarding process, and simpler cost structure. Meet Merlin Project Express. Merlin Project Express is an all-in-one planning software that doesn’t constrain you into any project management paradigm. Control multiple projects, resources, and budgets with ease in the way that streamlines your own workflow. Outstanding planning tools. The app lets you create tasks, sort out dependencies, track progress, and schedule for the future — all on one screen. By-the-minute tracking. See how much costs your project generates in real time. Check how busy and productive your team is, and how many hours a day get clocked in. Custom templates. Create intuitive templates for all repetitive processes and have your colleagues fire up new projects in no time. Precise resource management. Handle all information about your team, tools, and equipment in one secure place. Adding people is just as easy as dragging them from your Contacts, and the calendar view makes it effortless to see everything at once. Accurate project timelines. When you have a large project on your hands, how do you predict its success? The best way to do it is to break everything down to smaller tasks, which don’t seem daunting and are much easier to keep track of. Unlimited version-based attachments. Storing task-related information separately is a sure way to mismanagement on large projects. With Merlin Project Express, you just drop the required files right onto the task and it will keep it safe, including all the updated versions. The most special thing about Merlin Project Express is how intuitive it is. 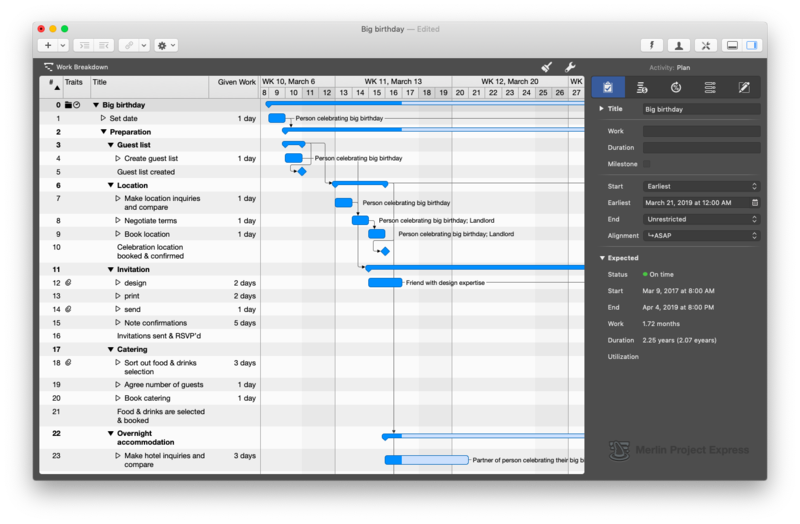 Everything you need to know is displayed on the main Gantt-like screen called Work Breakdown: the list of tasks goes top to bottom, and your timeline from left to right. Additionally, you can add any extra information (e.g. activities, goals) by pressing the plus icon in the top left. And the activity panel on the right provides specific details about your plan and finances. Clicking on the Work Breakdown, you can switch the screen to show Resources, which includes all the people in your team, their availability, rate, and accrued costs. Once you have all the tasks arranged, your project will begin to take shape. Next you just need to add timelines and people responsible. Finish up with a few milestones, so you know when it’s time to check in on the progress. And just like that your project will be on its way to completion, with no Microsoft Project management software involved. Best of all, Merlin Project Express is available to you on a free trial via Setapp, a platform of more than 130 Mac productivity tools and apps. And now when you know Microsoft Project for Mac is not needed, you can start substituting all the other Windows-only apps too!